trash: The Corp draws 2 cards. This card is almost as puzzling to me as Record Reconstructor. Without a Sweeps Week equivalent for runners, it seems to do nothing but help the corp. And in the few cases where it might be useful, namely vs an Accelerated Diagnostics + Power Shutdown, there are better options that cost the same, or less (if playing Shaper) influence: Sacrificial Construct. 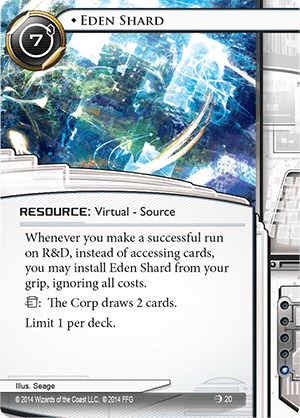 Unlike ES, Sacrificial Construct can always be installed for the low price of one , whereas to make ES worthwhile you almost always have to make a successful run on R&D, which costs you a anyway and potentially a lot of credits. Sacrificial Construct is a nice safety net for all sorts of situations, while ES's utility is extremely niche. Finally, Sacrificial Construct isn't limited to a single copy per deck, and if nothing else each copy can be sold to Aesop's Pawnshop / Chop Bot 3000 if it's not needed. Oh, and Sacrificial Construct can combo with Paige Piper while this cannot, and is more useful with Chop Bot 3000 / Aesop's Pawnshop. So clearly this must be useful some place where Sacrificial Construct isn't, and that has to be due to the fact that it forces a draw. Maybe in a Data Leak Reversal deck, but it's not needed there. It can increase the rez cost of IQ, but also its strength. Presumably one could use this after the corp's final , and if they were at their maximum hand size, they now have to discard 2 cards. But they get to choose which 2, and a corp deck without 3 copies of Jackson Howard is about as rare as unicorns are in real life—that is to say, quite rare. But, I think we'll succeed in getting a narwhal to interbreed with a horse before this will see play.